The insurer of Michael Jackson's cancelled comeback concerts has asked a judge to nullify a policy which would require them to pay out for the cancellation of the singer's scheduled shows at London's O2 Arena. Lloyd's of London has sued AEG Live and Jackson's company, claiming the concert promoter has failed to provide necessary medical information and details about the physician charged in the singer's death. Lloyd's issued a non-appearance and concert cancellation policy in April 2009 - roughly two months before the pop superstar died. It was issued under an alias, 'Mark Jones' and was supposed to cover up to 17.5 million US dollars in liability, according to the lawsuit. The promoter should have informed Lloyd's what it knew about the singer's medical history, "including but not limited to, his apparent prescription drug use and/or drug addiction," the case states. The insurer states a medical exam of Jackson required by the policy was never conducted, and that they should not have to pay out for the cancelled shows. Lloyd's lawsuit claims it has been seeking certain information from AEG about Jackson and his personal physician, Dr Conrad Murray, since December 2009. 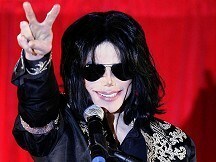 The cost of cancelling the London shows was one of the major debts facing Jackson's estate after his death.